Torre del Lago Puccini is a small town in northern Tuscany near Viareggio, Lucca and Pisa. Set between Lake Massaciuccoli and the sea, it's famous as the place where Puccini had a villa and for its summer Puccini Festival in the outdoor theater on the lake, one of Italy's top summer music festivals. Puccini called this area "paradise" and in fact, the lake is still very peaceful and a good place for a relaxing vacation. Puccini turned an old watchtower by the lake into a villa, now a museum, and wrote many of his operas there. You'll also see the town listed as Torre del Lago – the name Puccini has been added to the town name of Torre del Lago to honor the famous composer. Marina di Torre del Lago on the sea has a seaside promenade, restaurants, beaches, and discos during summer. Lecciona beach is a top gay beach. In July and August, the outdoor theater by the lake hosts the Puccini Festival with performances of his operas. Concerts and ballet performances are held in the theater, too. The theater is in a beautiful setting overlooking the lake and is surrounded by a park and sculpture garden. You can purchase tickets on the Puccini Festival website, or at the box office. 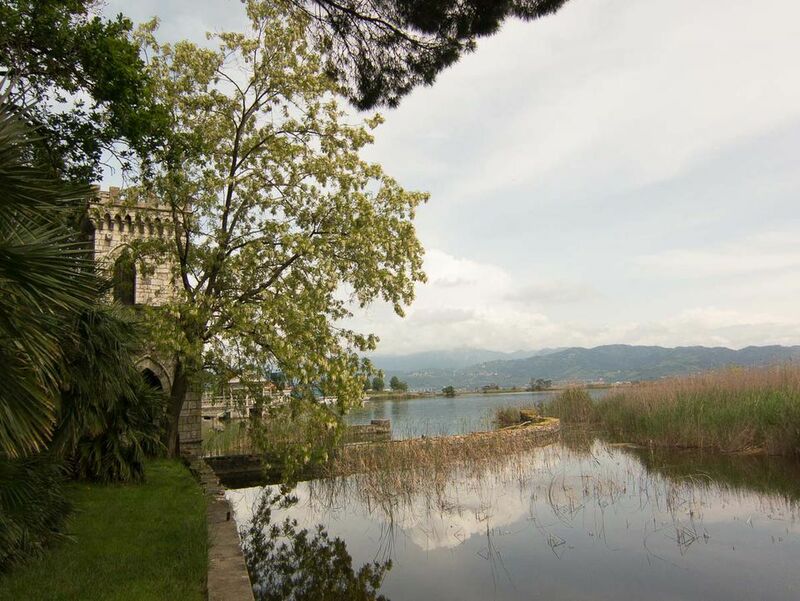 Torre del Lago is in the Versilia area of northern Tuscany, about 20 kilometers from both Lucca and Pisa. It's four kilometers from the seaside resort town of Viareggio and a short distance from the sea on the Tuscan coast. While the majority of hotels are in nearby Viareggio, there are a few houses with bed and breakfasts and a campground on the road between the lake and town. Villa Rosy is a simple 3-star close to the sea, with a large garden and parking. Torre del Lago is served by a few regional trains on the coastal rail line between Genoa and Viareggio and the rail line from Pisa. Faster trains arrive in Viareggio where you can catch bus line 2 or 3 to the town and lake. Pisa airport, 15 kilometers away, is the closest airport (see Italy airports map). From the airport, take the train into Pisa, then a train to Torre del Lago. The train station is in the town, about one kilometer from the lake. Villa Puccini Museum is in the former villa of the composer. Inside you can see photos and relics from Puccini's life, his piano, period furniture, and the chapel with his tomb. The museum is open to visitors for 40 minute guided tours in the morning from 10 am - 12:40 pm. There are afternoon hours most of the year, but these vary by season. For most of November, it's open only on Saturday and Sunday. Admission is €7 per person. During summer, boats offer lake excursions leaving from the Belvedere at Torre del Lago, from 3-6PM. Trips last about one hour and are a great way to see the lake and the wetlands. Sometimes the boats also operate on weekends during late spring and early fall. Oasi di Massaciuccoli, on the other side of the lake, is a protected nature area with boardwalks through the wetlands area, bird-watching blinds, and signs posted about the birds. IN the town above are Roman ruins and a small museum with Roman finds. In the hills above the lake, the Church of San Michele Arcangelo in Corsanico has an unusual early 17th-century monumental organ in the loft that Puccini is said to have played. You can hear the organ at the summer music festival or Christmas music festival. The beautiful Romanesque Church of San Pantaleo is also worth a visit. It holds a well-known chamber music festival in summer. We visited the churches on a tour with Serena Giovannoni. Viareggio is the largest beach resort town in Tuscany. Viareggio is known for its Liberty-style villas, beaches, and seaside promenade with cafes, shops, and seafood restaurants. It's also known as one of the top places to celebrate Carnival, with its spectacular parades of huge allegorical floats. You can take a cooking class at one of Viareggio's top restaurants. Pisa is known for the leaning tower but it has several other interesting sights and attractions, too. Torre del Lago can be visited as a day trip from Pisa. Pietrasanta is a small inland town to the north that's a favorite of artists.